Constant innovation has given birth to many unconventional techniques and products that have completely changed the way buildings and structures are constructed. These revolutionary products, technologies and procedures are aimed at simplifying construction and ensuring better end products at the same time. One such revolutionary product is the plastic brick mould. Brick moulds have been used in the construction industry for as long as one can remember. 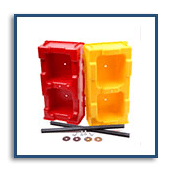 However, the modern plastic brick moulds stand out among them, as they are used to create bricks that are hollow and interlocking. The hollow core of the bricks helps in interlocking the bricks by simply stacking them on top of one another. You can get in touch with interlocking brick suppliers to know more about the products. 1. Empowering Unskilled Labourers – The unique set-up of the hollow-core brick moulds allows bricks to be created quickly and easily, without the need for any skill. This enables unskilled labourers to create the bricks and then use it for constructing structures like walls, ponds, sheds, houses etc. This has also supported the creation of local economies who derive their living from the manufacturing of such blocks. 2. Quick Construction – It is super easy to create bricks using the moulds. They can be created on the site itself as they do not require any external power. Also, the entire process of making and the drying the brick only takes about 48 hours. Similarly, construction of structures using the hollow bricks is as quick as stacking plastic building blocks on each other, making the entire construction process quicker. A structure of roof height can be built within a day only and can take load bearing immediately. 3. Cheaper Construction – Eliminating the need for external power and skilled labour; the use of plastic brick moulds brings down the cost of construction significantly. Since the bricks can be manufactured on-site; the cost of transportation is also eliminated. Overall, the production cost goes down significantly with the use of these brick moulds. Environment-friendly construction using recycled plastic waste and less energy consumption. Enhanced thermal insulation in structures as compared to conventional bricks. Less maintenance for structures built using hollow-core bricks. Interlocking bricks with a hollow core offer many advantages as compared to the conventional bricks. The plastic brick moulds used to create the hollow-core bricks have truly proved to be revolutionary, especially in empowering the unskilled labourers and local communities. Offering unique benefits for the construction workers, contractors and the environment, the plastic moulds and bricks are being widely used for construction.